"Don't worry about me," Al Nozaki told his parents after he was wounded in combat in November 1943. Albert Yoshio "Al" Nozaki was born on July 30, 1919 at Waialua in the Hawaiian Islands. He attended Leilehua High School, graduated in 1937 and was employed as an electrician at the Waialua Agricultural Company. Nozaki was an exceptional athlete and played baseball with Waialua. Nozaki entered military service on March 21, 1941 and initially served with the 298th Infantry Regiment at Schofield Barracks. Like many people in Hawaii, he was Nisei - second-generation Japanese, and on December 7, 1941, when the Japanese attacked the US fleet at Pearl Harbor, everything changed. Americans of Japanese ancestry in Hawaii were treated with suspicion and those in military service found their duties suddenly reduced to menial tasks. Eventually, the 100th Battalion was formed, a fighting unit made up entirely of second-generation Japanese. 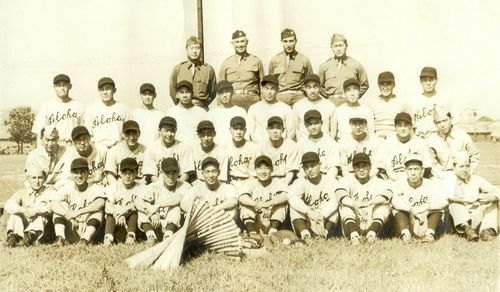 Nozaki took basic training with the 100th at Camp McCoy, Wisconsin, and quickly became a part of the 100th "Aloha" baseball team. The Aloha team initially played against the military police unit at Camp McCoy but soon found competition in nearby towns. In February 1943, the 100th Battalion moved to Camp Shelby, Mississippi for advanced unit training where the Aloha team continued to play. On September 19, 1943, the 100th Battalion left the relative safety of North Africa for Italy. They landed at Salerno and went into combat against the Germans on September 29. He was wounded on November 4, 1943 and spent several months in hospital before returning to his unit. In March 1944, Corporal Nozaki was promoted to sergeant and in a letter to his parents on April 22, he stated that he was well and for them not to worry about him. Sergeant Nozaki was killed in action near Borgo, Italy, six days after writing that letter on April 28, 1944. "He was killed by sniper-fire," explains his nephew, Darren Sadao Nozaki, "while performing a perimeter watch. We were told by a member of his platoon, that Al was not supposed to be on watch, but he volunteered for the duty since many of the men were weary." On June 4, 1944 memorial services were held at Waialua Hongwanji temple. His body was returned to Hawaii in September 1948 and he was cremated at the Honolulu crematory. In October 1948, the W. A. Kinney American Legion Post No 5 in Waialua was renamed Kinney-Nozaki Post No 5 by his comrades. Thanks to Darren Sadao Nozaki and his family for help with this biography. Excerpts taken from In Freedom’s Cause: A Record of the Men of Hawaii Who Died in the Second World War (1949) with permission from The University of Hawaii Press. Visit www.ajawarvets.org for more information on Americans of Japanese ancestry servicemen. Photo of 100th Battalion team courtesy of Sons and Daughters of the 100th Infantry Battalion Archives. Thanks to the Honolulu Advertiser for supplying copies of related press articles.